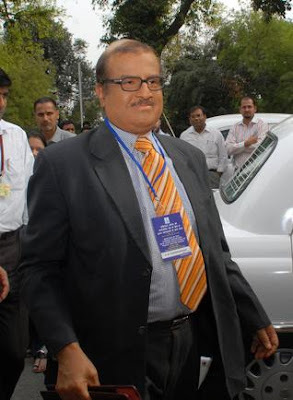 AIADMK general secretary J Jayalalithaa on Wednesday said the transfer of Vineet Agarwal, the officer heading the CBI investigation into the Rs 1-lakh crore Spectrum scam allegedly involving Union Telecom Minister A Raja, shows that the UPA government has succumbed to the pressure from the DMK for giving the scandal a decent burial. In a statement on Wednesday, she said the officer should be brought back to head the CBI’s investigation team and law be allowed to take its own course in the scam, which has caused loss to the exchequer to the extent of Rs 1,00,000 crore. She demanded that Raja, who was indicted by the Central Vigilance Commission for flouting Prime Minister Manmohan Singh’s written directions on the sale of 2G spectrum, be sacked. The Prime Minister of the Republic of India, H.E. Dr. Manmohan Singh, the President of the Federative Republic of Brazil, H.E. 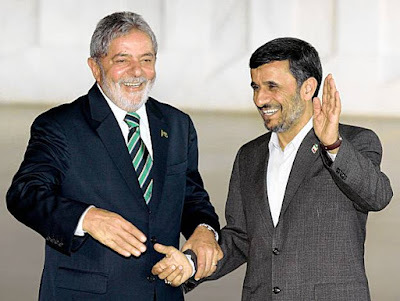 Mr. Luiz Inácio Lula da Silva, and the President of the Republic of South Africa, H.E. Mr. Jacob Gedleyihlekisa Zuma (hereinafter referred to as “the Leaders”) met in Brasília, Brazil, on 15 April 2010 for the 4th Summit of the India-Brazil-South Africa (IBSA) Dialogue Forum. 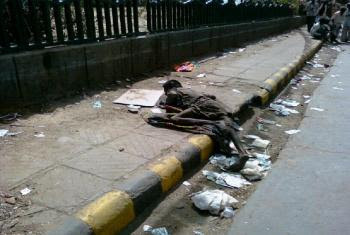 Even as the corporate media celebrates Mukesh Ambani, India's wealthiest resident (and the world's fifth richest person) who is building Antila, the $2 billion home at about 400,000 square feet on Altamount Road, Mumbai which will be among the world's most expensive homes, at 42 degree Celsius, here is a man lying on the roads of a capital of a country which corporate media will have us believe is World's emerging super power. There are 1,011 billionaires in the world today, according to Forbes magazine. U.S. still has almost as many billionaires as the rest of the world put together — 403 billionaires or about 40% of the worldwide total. Of the 97 first-time billionaires, 62 are from Asia. China has 64 billionaires. India has 52 billionaires. Of the 100 richest people in the world, 11 are women. Proposed National Intelligence Grid (NATGRID) on hold ? United Progressive Alliance is progressing towards the having Unique Identification Number for citizens and networking 21 available databases across government and private agencies to 'flag potential terrorist threats.' It is claimed that in less than two years, these databases will be linked to enable security and intelligence agencies get any information at the press of a button under the National Intelligence Grid (NATGRID). NATGRID is a plan of P Chidambaram, Home Minister. The sudden spurt in the instances of paid news, particularly during elections, is a blot on free press and democracy. Can Press Council and Parliament take measures to curb such dangerous tendencies? "Today, the demands of professional journalists are carefully balanced with the interests of owners and stakeholders of media companies and their cross media interests. The interplay of these conflicting demands is evident and subject of public debate." Fourth Estate has an identifiable commercial and explicitly for-profit persona. Participation of corporations and mafia in politics has been an open secret from the outset. Now there is emerging evidence that they are participants in media as well, making it difficult to define the journalism in the era of Paid News. TEHRAN – Alexander Pikayev, the director of Russia’s CNS Non-Proliferation Project, says Iran demonstrated its strong commitment to nuclear disarmament and to the nuclear Non-Proliferation Treaty by hosting the Tehran nuclear disarmament conference. A number of major international figures, nuclear experts, and foreign ministers as well as anti-nuclear weapons campaigners and representatives of international and non-governmental organizations attended the Nuclear Energy for All, Nuclear Weapons for No One conference, which was held in Tehran from April 17 to 18. The Tehran nuclear disarmament conference “demonstrates Iranian commitment to nuclear disarmament and non-proliferation,” Pikayev told the Tehran Times in an interview on the sidelines of the conference. On Wednesday, the volcano under Iceland’s Eyjafjallajokull (“AY-yah-fyah-lah-YOH-kuul”) glacier erupted, pushing a cloud of ash and particles 6-9,000 metres into the air. “Eyja” is the Icelandic word for island. How Iceland’s Eyjafjallajokull volcano finally blew its top? Iceland’s Eyjafjallajokull volcano is in the second phase of an eruption that began last month. The eruption started when subterranean liquid rock -magma -found a weak spot in the earth’s crust and burst through. Because of its location between glaciers, the eruption was largely ash-free. 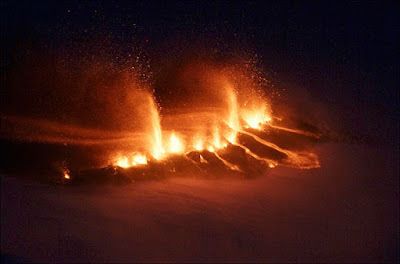 But then a second, more powerful eruption followed, through a rupture close to the volcano’s glacier-covered summit. Fire met ice and fire won. Huge amounts of ice melted and flash floods followed. Once the eruption melted away the icy lid, some 150m (492ft) thick, the volcano began to belch ash into the atmosphere. Modertaor's Note: A recent objection from KM Chandrasekhar, the Union Cabinet Secretary to the use of iris recognition (IR) test as a part of Unique Identification Database (UID) project sets one thinking about the dangers from this project. Claiming the test has a useless expenditure, Chandrasekhar had been reported to have requested Prime Minister Manmohan Singh to omit it as the third tool for the UID project. Chandrasekhar said, "It is an unnecessary recurring expenditure, which will have to be paid to an American company." Nandan Nilekani, Chairman, Unique Identification Authority of India (UIDAI) had proposed to bring in high tech tools for the recognition process. According to reports, Nilekani had suggested IR test beside fingerprinting and face recognition as biometric identification. The IR uses pattern recognition to create images of the iris of an individual. New Delhi: The Income Tax department's proposal to issue biometric PAN cards has been put on hold so as to avoid duplication with the UID numbers to be issued by Nandan Nilekani's Unique Identity Authority of India (UIDAI) . The biometric Permanent Account Number (PAN) card was proposed by the then Finance Minister P Chidambaram in 2006 to counter the problem of duplicate PAN cards which were uncovered during I-T searches and raids by police and other enforcement agencies. The proposed biometric PAN cards would have carried the I-T assesses' fingerprints (two from each hand) and the face. Such a card, it was hoped, would be difficult to duplicate or manipulate. But after the UIDAI was set up last year, the Authority decided to create a database of similar biometric information for all residents of the country. Iran says its upcoming denuclearization conference aims to send the message that nuclear weapons have no place in the world — particularly in the Middle East. "We would continue to send this very strong message from the capital of Iran, Tehran, the center of the Middle East, that nuclear weapons do not have a place at all in this very sensitive part of the world," Mohammad Mehdi Akhoundzadeh, Iran's deputy foreign minister, told Press TV ahead of the international conference on nuclear disarmament scheduled for April 17th and 18th.